Hey guys sorry it has been a little while since i got up pictures and a run down of life. Things have been pretty busy. Last week was a lot of fun. We had a good St. Pattys day celebrations on Wednesday followed by 4 days of nonstop paragliding action. The winds where predicted in our favor and was supposed to be the best 4 days of flying we had thus far and my NEW WING GOT IN ON MONDAY :) !!!!!!!! Sadly the winds didn't do exactly what they where predicted to. Thursday and Friday we alright days we some big wing flying in-between gusts and rain showers. But Friday night I got super luck as all the stars aligned; i was the last one up and with enough height/wing to fly 'home.' Basically the beach access is about 5km up the beach, in the morning we 4x4 down the beach to the launch site. On Friday I got the ultimate excitement/pleasure of flying form the launch site all the way back to the car park. It was AMAZING to say the least, although i was a little chilly up there. And then Saturday rolled around. It was crazy the wind was good and the people where plenty. There must have been close to 40+ people at the launch site (which is only about an acre big or less). At some points in the day there wasn't nearly enough room for you to layout your wing and prep. But the winds where good and we got some amazing flying in. 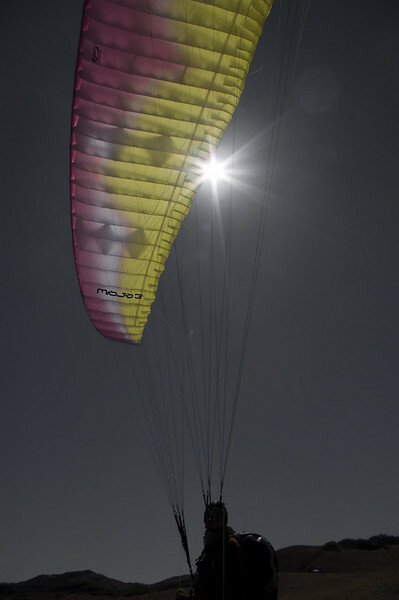 Matt and I where able to move out of the main pattern of paragliders and fly down the beach just a little way for 1hour+ it was an awesome feeling to be able to soar for that long and really start to get the hang of my new wing. Because of the amazing four days we had homework, which was due on Monday, sort of got pushed onto the back burner. I ended up having to stay up till 1am ish after a full day of flying working on my statistics paper. I then had the pleasure of waking up at 8am to do my statistics online exaime, which i got a 100 one :P. Then some classes and more time devoted to getting my statistics homework done by the dead line; 3:00pm. I turned mine in completed promptly at 2:30. A new weekend of paragliding is about to start. Thursday we got the first day of rain, which killed a day of paragliding. And today we went but only had the small ground handling gliders out since the wind was so strong. The weather looks a little better for tomorrow, we will see. We have the Easter Break rapidly approaching which I am getting really excited for. Next Thursday I will be heading to Rotorua for a thermaling class that will last till Monday night. Then a day of packing and getting food and we are starting our 12ish day road trip all around the North Island. Sadly I haven't made it down to the South Island yet, but one of these 5day weekends I am going to just fly down to Queenstown and hang out there for a while. Hope everything is great with all you friends and family!